before you can become nobody. Abraham Maslow was an American psychologist born in 1908 and he died in 1970. Maslow's primary contribution to psychology was rather than focus on the negatives of what made some people psychologically sick and how to make them better, he thought outside the psychological box of the time. Maslow focused on psychological positives and believed each of us has a strong desire to realize our full human potential (what he termed becoming fully actualized). He developed a psychological roadmap which he felt helped or inhibited us from reaching personal self actualization. In 1943, at the age of 35, Maslow was teaching at Brooklyn College and he wrote a paper titled A Theory of Human Motivation. In the paper, he focused on trying to describe what motivates us as humans to want to reach our full potential and the different stages of our psychological development along that path. He felt our psychological growth toward self-actualization was intrinsically tied to our basic human needs and how well we mastered each of those needs. Over the next 11 years, he refined his theory and presented it in full detail in his 1954 book which he titled Motivation and Personality. Defining this basic human desire and the path to reach our full potential was really Maslow's primary contribution to the field of psychology which eventually became known as Maslow's Hierarchy of Needs and is most often displayed in the form of a triangle. Maslow's original triangle had 5 levels of basic needs. 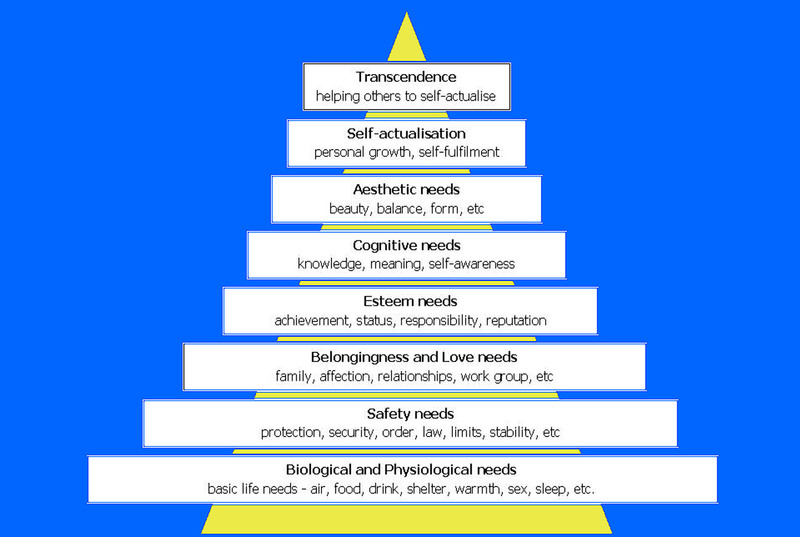 He later further delineated the hierarchy to include three other levels breaking our human needs into 8 levels. He arranged them in a hierarchy such that we are motivated primarily by a need only if the lower level needs have been met. Thus before one feels compelled to address cognitive and aesthetic needs, one needs to have taken care of things like biological, safety, etc. needs. Also, one cannot transcend and help others become self-actualized unless one has already become personally self-actualized. Basic Needs or Physiological Needs - these are somewhat obvious and necessary for basic human survival. Without food, air, drink, warmth and sleep, the human body cannot continue to function. Safety Needs - Once physical needs are somewhat satisfied, focus on safety needs take precedence and dominate our behavior. These needs being satisfied quell our need for an orderly predictable world where unfairness and inconsistency are under control. Belongingness and the Need for Love - Once basic and safety needs are met, human needs become social and involve a need for acceptance and to love and be loved. If these elements are absent, social anxiety and depression can arise. Esteem Needs - This level is is attained when individuals feel comfortable with what they have accomplished from a success and status standpoint. Cognitive Needs - At this point, we feel a need to increase our intelligence and we chase knowledge to gain a better understanding of the world around us. We now feel a need to explore and desire new experiences. Aesthetic Needs - With the previous needs satisfied, we now find we need to refresh ourselves with the presence of beauty, nature, art, music and the other aesthetically beautiful things the world has to offer. This leads to a beautiful feeling of intimacy and oneness with nature and everything beautiful. Self-actualization - This is our instinctual need as humans to make the most of our abilities and to strive to be the best we can be. Quoting Maslow "What a man can be, he must be." It is also at this level that individuals experience extraordinary moments called Peak Experiences which include transpersonal and ecstatic states tinged with themes of euphoria, harmonization and interconnectedness. Transcendence - Having personally self-actualized, there is a desire to help others self-actualize. In doing so, we connect with something beyond the ego and we experience states beyond normal human consciousness and take things to another level of being. Maslow's depiction of human needs seems basic to all societies. However, local societal programming and personal egos have a lot to do with how much we feel is personally required of each need before we feel motivated to reach for the next higher level need. In Western societies, we tend to feel we require much more of the lower level needs (food, shelter, clothing, objects, safety, love, accomplishments, status, etc.) to be satisfied with those levels than individuals in Eastern societies. Consequently, our Western egos and desires for more objects and status often slow our progress toward self-actualization and transcendence over our Eastern counterparts who do not place such high premiums on lower level needs once those basics are provided. In fact, being overly prosperous and status oriented are often inhibitors to seeking and achieving self-actualization and transcendence.